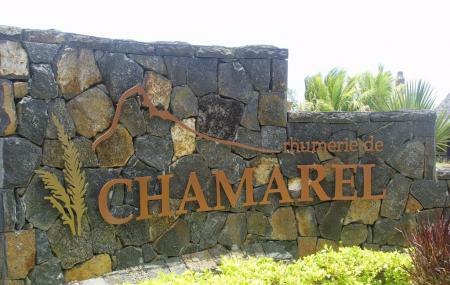 Set in the South Western part of Mauritius, in a fertile valley, Rhumerie de Chamarel distillery is known for its fine range of Rum. Take a tasting tour at the distillery where you can observe the Rum making process in depth. Right from selecting the ideal sugarcane, handpicking the plants, extracting the juices and fermenting it to perfection, Rhumerie de Chamarel distillery infuses unique aromas that enhance the flavour of the Rum. You can finish up the experience by having a delectable meal at the ‘A la carte restaurant’ of the distillery. The ambience with wood, natural stone and water add to the rustic experience. Children (up to 12 years old) have to be accompanied by their parents and rum tasting is not included. Tours available in English and French. Duration of tasting tour: 30 to 40 minutes. How popular is Rhumerie De Chamarel? People normally club together Chamarel Waterfall and Curious Corner Of Chamarel while planning their visit to Rhumerie De Chamarel. The tour was nice, but we had some problem understanding the pronounciation of our guide. A big plus was that we actually got to taste 9 different kinds of rum/liquor. Beware that there's a 20 minute waiting time for the tours. Very nice place to visit and taste rum, and to eat good food on their restaurant. Also the landscape is great in that area. Great scenery. Restaurant that serves food and rum drinks. There is a shop that sells all kinds of gifts which is a-bit pricy. They also offer rum tours of how its made with a tasting sessions at the end, the tour can be booked on arrival. The road to the place is very scenic and should be driven with care as there are many sharp turns. Loved the beautiful scenery! Well situated restaurant with greenery & exquisite flowers! Delicious food & desserts! Tasty Rum Cocktails! Very much appreciated the moment spent at the restaurant, the guided tour of the distillery & the Rum tasting..!! And a special thanks to the very helpful and professional staff Mr Kevin!